Watering your garden wisely not only will result in healthier plants, but you'll save money and time to boot. As much as possible, follow the golden rule of watering: Water deeply and well rather than shallow and often. If you water often, the roots stay where the moisture is—the surface—and grow shallow. Watering deeper and less often encourages them to grow downward where the soil stays moister longer. Most plants do best with approximately 1 inch of water a week. 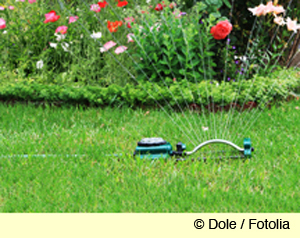 If you haven’t had an inch of rain for a week, apply an inch of water from the hose or sprinkler. So how can you tell how much water you’ve applied? Set out an old cake pan, margarine tub, or other shallow, flat container where the sprinkler will hit it. By the time wilting has occurred, the plants are already stressed. And a wilted plant instantly becomes more susceptible to insect, disease, and other problems. Instead, look for early warning signs. Keep an eye on the soil and take note when it's hard or dry. Wiggle your finger or a stick into the soil to check. Also note if plants' leaves becoming less glossy. Another trick: Look at your impatiens. These thirsty plants are usually the first to show signs of dryness. Being done right before sunrise is ideal, so set up a timer. You’ll avoid the heat of the day and prevent evaporation. Early watering also allows plants to dry off well before nightfall, when fungal diseases take root. Avoid spraying plant foliage during watering since it makes them more prone to disease. Of course, sometimes you’ll need to use a sprinkler, and getting the leaves and flowers wet will be unavoidable. But when using a hose or watering can, water just the soil. Better yet, consider investing in a drip-emitter system, micro-sprinklers, or black soaker hoses. These slowly apply water exactly without waste where you want it.